The interior is quite dark but you can still take some good pictures of the various statues. They charge a mandatory 100 LKR fee if you want to take photos. There are no direct bus or public transport to this point, so you need to take a taxi from the main road. You have to remove your shoes before entering insinde. The temple was closed when we visited around midday and a local shopkeeper said it didn't reopen until 5pm..we were here on 26 December so it may not be the case at different times of year. There weren't any opening times posted on the door. Even though we didn't manage to see inside, it was definitely worth the visit to see the exterior which is lavishly adorned with hundreds of carved and brightly painted statues/Hindu deities. If you've never seen anything like this before (I've seen similar in Malaysia) then this is a must see because it's pretty over the top and dramatic. Looks even more so as it's down among some narrow back streets so it really leaps out from its surroundings. I took loads of photos of it, loved it. 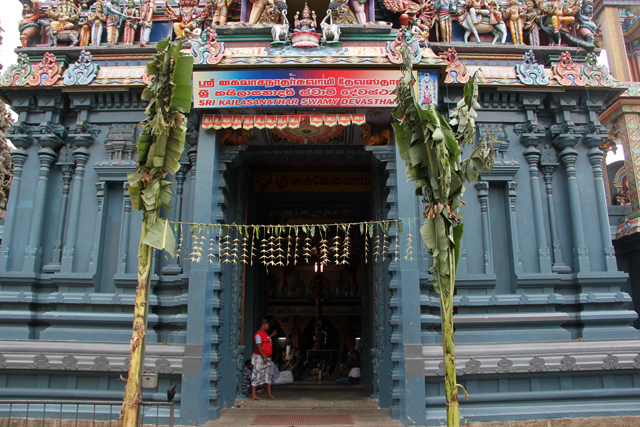 I would say it's a must see when in Colombo even if just to drive by and stop to take exterior photos as we did.